to request the specific automobile that you are looking for. As soon as the automobile of your choice is added to "ADC Auto Trader", you will be contacted directly. Free registration! 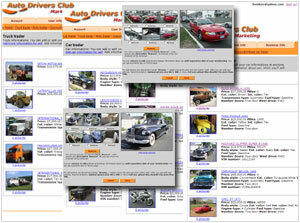 to add your business to the "Auto Drivers Club" search system. It includes over 25,000 auto businesses in the U.S. where clients can search your business by location and/or by the services that you provide. Make your business part of the search today - FREE! Become an “ADC Agent” and get paid. It's easy! Once you register, you will receive a "coupon number". Give the number to your friends and associates. Every purchase they make, you receive 10% from deal. Free registration! Add your cars to "ADC Auto Trader". Choose the plan that is right for you, whether you’re selling 1 car a month or 50. You can update or change information at any time, during the time of your membership. Meanwhile the car/s on “ADC Auto Trader” will be displayed until they are sold! Don't have a Auto Drivers Club account?